Sour Cream Lemon Scones. 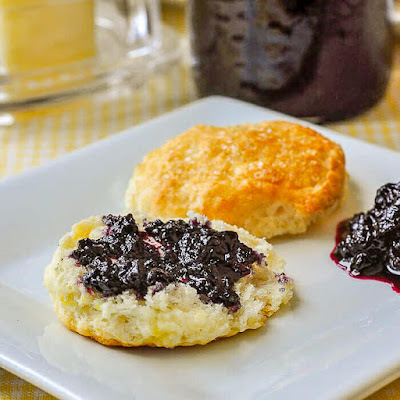 Beautifully light and tender little lemon scones that go together particularly well with wild blueberry jam. Perfect for weekend brunch or morning coffee. These fragrant little lemon morsels remind me of a formal afternoon English tea. I think they would fit right in beside the cucumber sandwiches and Victoria sponge cake. We enjoyed these this morning at brunch with some simple, freshly made Newfoundland wild blueberry jam and they were scrumptious. Beautifully light and tender little lemon scones that go together particularly well with wild blueberry jam. In a food processor, blend together the flour, sugar, baking powder, baking soda and lemon zest. Do not over incorporate the butter into the flour. Similar to making a flaky pastry, small pieces of butter should be visible in the flour. Transfer this mixture from the food processor into a large mixing bowl and make a well in the center. Mix together the sour cream, milk and vanilla. Pour into the well. Working very quickly with a wooden spoon, fold the dry mixture through the milk and sour cream mixture, only until the flour disappears, then stop immediately. Drop the sticky dough onto a well floured counter top or bread board. Sprinkle the top of the dough with additional flour as well as flouring your hands to handle the dough. I don’t even use a rolling pin for these biscuits, the dough is soft enough to pat it out gently with floured hands to a thickness of about 3/4 inch. Using a small biscuit cutter cut the biscuits out an place them, 1 1/2 inches apart on a parchment paper lined baking sheet. I recommend an aluminum baking sheet because it tolerates the higher oven temperature without burning the bottom of the biscuits. Whisk together the water and egg and brush lightly over the top of the biscuits. You will only need a little of the egg wash mixture. Sprinkle with some turbinado sugar if desired. Bake for 13-15 minutes or until the tops are golden brown. Cool on a wire rack. 0 Response to "SOUR CREAM LEMON SCONES"